Welcome to another fabulous product review! There will be quite a lot of these coming up in the next few weeks, including Zevia, Bearded Brothers, So Delicious, Snapz, Rush Bowls, Better Beans, Thunderbird Bars, and more! Many of those include giveaways - so be sure to keep checking back! Today, I bring you Cookiehead products! I have to say, the Cookiehead line is much more extensive than I knew - the company features a wide variety of brownies, cookie, & muffins to enjoy. Each product is packed to the brim with whole grains and yummy, healthy-for-you foods, like sunflower seeds and spelt flour and flax seeds! Products are also full of fiber and omega-3s - how much better can it get? I'll tell you. The packaging on the products are so stinkin' adorable! That was the first thing to catch my eye and draw me in. When Cookiehead agreed to send me some products to review - they were very enthusiastic, I might add! - I couldn't have been happier. They sent me a wide variety of things to try - and full boxes of each! Boy, I was excited! Let's start with my favorite, shall we? Sprouted Grain Mini Brownies, made with sprouted spelt flour! These are probably the best store-bought brownies I've had. They are so rich in dark chocolate, very moist, and only 53 calories a piece! I eat these like it's my job. It's a wonder I still have some left! They also have 8g of whole grains per serving, and are milk-free and kosher. I highly recommend these. Next: Flax Snax Cinnamon Honey cookies, Dark Chocolate Chunk cookies, & Coffee Chocolate Almond cookies! While I only got to eat one of the cinnamon honey cookies (my mother devoured the entire box in half a day...), they were yummy! They had a very unique flavor - I think I just wasn't expecting such a strong honey flavor, but it was definitely prominent. I also loved the hint of cinnamon, and the flax seeds were visible. 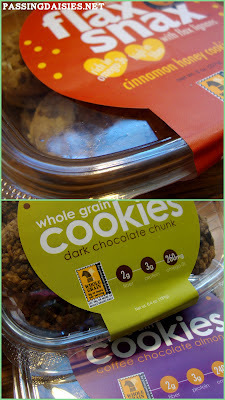 Also, these cookies have 8g whole grains and over 1000 mg omega-3 fatty acids in each serving - amazing! The coffee chocolate almond cookies were my favorite of the 3 cookies I was sent. The coffee is very strong, and with the chocolate, these cookies taste like a mocha you can bite into. I also love that, in both these and the dark chocolate chunk, there is a nice crunch from the sunflower seeds. Which, I might add, I was definitely not expecting in a cookie! Still, it was a nice surprise, and I loved it. As for the dark chocolate chunk, well, they were just as stellar. You really can't go wrong with a chocolate chip cookie. All cookies were moist and contain 9g whole grains, 2g fiber and protein, and 250mg omega-3 fatty acids per serving. What healthy cookies! Last up: Cranberry Orange Grainy Brainy Wakey Cakes. What a name! I was a little disappointed that only two mini muffins weighed in at over 200 calories (I don't remember the exact number, but I believe it was 260+ calories?). Still, these were delicious. And totally worth every calorie. These had an intense orange flavor, crunchy sunflower seeds, and yummy dried cranberries. These, like the brownies mention earlier, are also made with sprouted grains. Overall, I applaud this company. Great work. Keep making healthy, kid-friendly products, and stuffing them full of nutrients! I highly recommend ordering some online if you cannot find them in a retailer new you! SOLD! I love the vast amount of goodness they pack in each product. me too! they are great! What a great review, thanks so much for sharing! :) The company sounds great, I'm about to go check out their website.